Birdhouse matches the Chadds Ford Historic Society Building, originally uploaded by DianthusMoon. Last September, I went to a stitch-along at the Chadds Ford Historic Society and got to meet some online pals. I haven’t been back yet, but I also haven’t stitched a whole lot this past year. 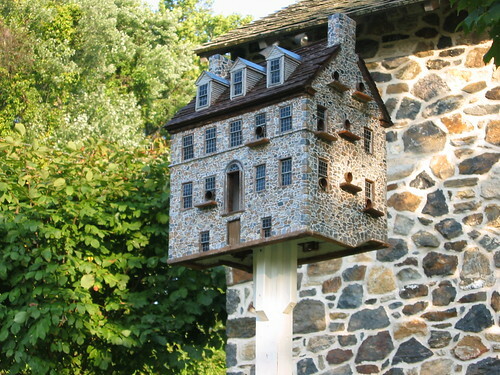 This is a birdhouse crafted to look like the building I was in! Look at all the triangles along the roof line. Beautiful craftsmanship! Today I received my letter that I was excused from the jury selection people-two women-perhaps they understood my dilemma at this time. I have a feeling I’ll be called again in the future. What an intricate bird house! Built with more care and craftsmanship than many a home for humans!! Oh yes, it’s amazing the talent out there, that birdhouse is something else!! Gorgeous! that birdhouse is just awesome. how many birds are inside the house?